Move over fidgit spinners, the Mokuru is here to take over. Japan has supplied us with the latest in this craze with the Mokuru. This was originally designed to test an individual's balance and focus - now its testing the dexterity of fast fingered flippers. Crafted out of beech wood into an eye catching cool design, players can flip tip and spin one MOKURU or more. MOKURU is the new black or, as the Japanese say, Genbu. Also available in green (Matcha), orange, (Kirin) white (Byakko), red (Suzaku), blue (Seiryu) and yellow (Inazuma)! Small enough to fit in a pocket or a purse, MOKURU is the go anywhere toy for all ages, a new game for kids to play in the playground, and for big kids to play in the bar, at a desk, or to be played against others in competition. Players can refine their techniques until they become a MOKURU master. Fidget spinners are so over. Designer Masakazu Node has worked hard to ‘create the perfect size, shape and materials’ for MOKURU. Now the fast flipping toy will be distributed in the UK and Ireland exclusively by Peterkin. Already a big hit in many markets around the world, including Japan and Hong Kong, beginners can simply tip over the toy, let it flip and catch it with their fingers or flip it to draw a triangle or square. MOKURU masters can use five MOKURU at once with one hand. 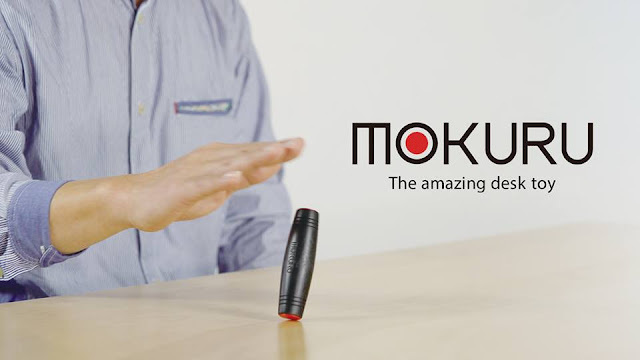 Claimed to help focus and concentration, imagination and alleviate stress, MOKURU fits into your pocket. We have three on offer to giveaway. Competition is open to UK entrants only, colour of the Mokuru cannot be specified so you may receive any colour.